It is no secret that a landscaped yard can cause envy in the neighborhood, but did you know it can also mean money back in your pocket at the time of sale? Did you know, in a recent University of Michigan study, landscape updates were shown to boost property values up to 11 percent. That means that if you’re looking to boost your home’s rates on your next evaluation, your best bet may be to head to the backyard. Installing a deck or paver patio can recoup you 75% of your investment at the time of sale- that is higher than most kitchen or bathroom remodels! 5 Tips to add More Green your yard! Every gardener loves to earn the reputation of having a green thumb. However, there are eco-sensitive steps you can take that will make sure you are a green gardener, regardless of how gifted you are at getting the most from your plants. 1. Select your plants with your locale in mind. Find plants that are native to your area and resistant to your local animals- ask an expert if you’re unsure! You can choose plants accordingly and achieve a sustainable lawn and garden with less ongoing effort and maintenance. 2. Repurpose your lawn clippings, leaves, and plant trimmings. These items offer a good alternative to some fertilizers, and a little composting will create excellent potting soil. 3. Recycle household items as gardening material. Old cardboard and newspapers serve as good weed mats, and adding a little Styrofoam to the bottom of a pot will aid in proper drainage. You can challenge family members to come up with creative ideas, such as using egg cartons to start your seedlings. 4. Minimize your use of chemicals, fertilizers and pesticides. Runoff from gardens is one of the biggest pollutants to the Chesapeake Bay, and you can find many natural ways to control some of your worst bugs. However, understand that many insects are actually beneficial to your lawn and garden, and you often eliminate them when you over spray or treat with too many chemicals. 5. Think out of the box when it comes to your home landscaping. In today’s environment you’ll find a lot of options that differ from the traditional “perfect landscape.” Your local landscaper can help you select different concepts, designs, and plants that will make you home stand out as both beautiful and environmentally sensitive. Hometown Landscape & Lawn Service can help you out with an array of services to suit your needs. Get into the frame-of-mind that you can have a green thumb and make a statement with your lawn and garden – you’ll have a whole new appreciation for your living space. Plus, you may well serve as an inspiration to others to make their spaces more sustainable. August is a fabulous month in the vegetable garden for many of us. The summer crops are overwhelming us with their productivity (hopefully!) and the crops we sowed last month are coming along beautifully. But August need not be a time only to harvest the mid-season crops. You can still plant in August. For many northern gardeners, the focus now will be on planting fast-maturing cool season crops that will mature in a few weeks for fall harvest. Cool-season grasses go dormant to protect themselves during long, hot periods when they do not have enough water to remain in an active growth phase. Warm-season grasses go dormant in cold weather, when they die back naturally. In both cases, the grasses’ crowns remain alive, and, in hot situations, water may revive the grasses. Don’t worry: Dormancy is a natural, built-in protection mechanism, and your grass probably will return when the weather cools in fall. Dead grass is hard to detect, especially during hot summer months, when grass often becomes dormant as a response to heat and accompanying drier soil, and during winter months, when grass becomes dormant as a response to cold temperatures. One of the best ways to detect whether or not grass is dead in hot summer months is to keep watering it. Keeping grass green with irrigation can help highlight brown areas that might be dead. In winter, when grass is dormant because of cold weather, determining whether or not grass is dead can be more difficult, and you may have to wait until spring to see if it comes out of dormancy. Dormant grass often looks exactly like dead grass, but one measure helps to ensure that dormancy doesn’t equal death. In a low-water situation, grass becomes dormant as a natural response to protect its crowns from which grass blades grow. The dormancy can look like death, but unlike death, the grass still needs a minimum amount of water to get through a hot, dry period without dying. You may not know whether the grass is dead or dormant, however, until it becomes green again in fall or spring. Changes in weather often bring grass out of dormancy naturally. If grass is a cool-season variety, it turns green with fall’s lower temperatures and increases in water. Warm-season grass varieties liven up when temperatures rise. If you want your lawn to remain green year-round, plant a mixture of grass seeds so that a cool-season variety and a warm-season variety take each other’s place as weather changes. Increasing irrigation may keep cool-season grass from going dormant, but not much can be done otherwise. 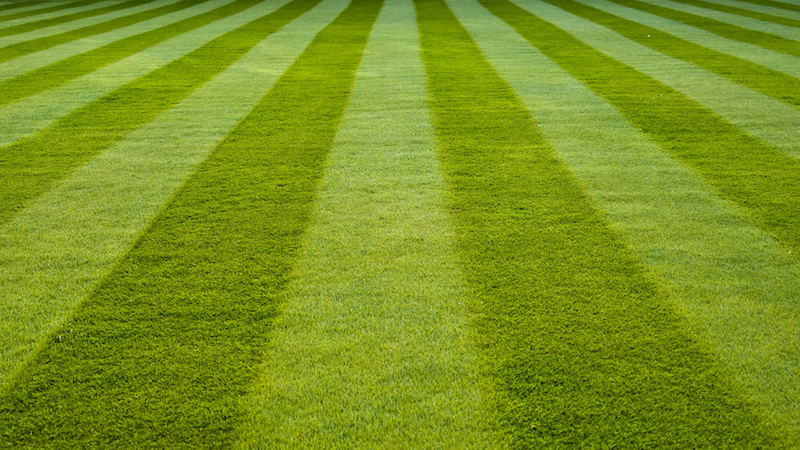 A healthy lawn does not necessarily mean that it has to be short. When cutting into your lawn, the blades need to be set as high as possible. The length of grass, preferably high, provides numerous amounts of benefits towards keeping the soil healthy and productive. Tall blades of grass are able to obtain more light during peak sun hours and, in turn, will use this energy to produce and provide more nutrients to the roots and surrounding soil. Taller blades will also provide shade that allows for the soil surrounding each blade of grass to maintain moisture throughout the dry heat of most summer days. The waste produced in regards to your mowing should not be considered waste. The clippings that you produce during your mowing time should be redistributed across the lawn. There are certain mowers that do not collect clippings in bags but rather just cut and allow for the shredded lawn to fall back into the grass and the soil. These cut blades of grass will be able to supply the soil with an added supply of nutrients as well as additional shade to further along the growth of a healthy lawn. Fertilizing at both the beginning of the spring season as well as at the end of the fall season is vital to your grass maintaining a healthy lifestyle. Most organic fertilizers used in the spring allow for the soil to be kick started with an abundance of nutrients to inhibit growth at a more rapid pace. On the opposite side of the spectrum, most winterizing fertilizers allow for the soil to capture nutrients and store there to maintain a healthy landscape during the harsh snow and inclement weather of the winter. Any patches of lawn that do not seem to grow properly needs to be seeded accordingly. Patience is the key in this situation because some homeowners tend to seed barren lawn patches more than once which in turn will cause the soil to be overworked. Seeding once and maintaining a proper water schedule on those parts will show some improvements in the days and weeks to come. Weeds are a nuisance to any lawn across the country. There has to be a conscious effort to walk your lawn on an every other day basis to find any instance of weeds and remove as soon as possible. This will allow you to catch newly formed weeds before they have a chance to grow roots and stake a claim in the soil of your lawn. Hydration is essential to the growth and nutrition of your lawn. The entire landscape surrounding your home needs to have at least an inch of water on a weekly basis. This inch of water can come from rain or can come from manual irrigation through your water hose. The main keys to remember when it comes to manual hydration are to water as early as possible as well as not to over-saturate your lawn. All watering must be done in the early morning hours so that the soil can absorb all moisture before any sun and or heat has a chance to dry it up. The watering must be measured, through the use of a coffee can as an example, to make sure that you do not over water the lawn and cause the soil to become infertile due to too much moisture. Why choose Hometown for dumpster rentals? Let’s face it: home renovations, do-it-yourself projects, landscaping work and construction projects are anything but glamorous. When you want to simplify your work- hire a dependable contractor. Hometown Landscape serves the DC, Maryland, and Northern Virginia areas with 20 and 30 yard dumpster sizes. These are perfect for both residential and commercial usage. Going with small local businesses is a smart idea because big companies just can’t compete when it comes to providing communities with genuine, face-to-face customer service. Hometown is Committed to exceeding customer expectations. When you rent a roll off dumpster from Hometown Landscape, you get to decide exactly where and when your dumpster is placed. Depending on the dumpster size, to make your big project easier, they can place the roll off dumpster exactly where you want it. Pests are more likely to attack a stressed plant than a healthy plant. A few insect pests are normal and not cause for concern but if you get a more severe pest infestation, it means something in your garden or locale has become severely out of balance. Talk to a nursery or garden center professional to help identify exactly which type of pest you are dealing with and how best to treat them. For instance, there are organic pest controls that can help you control them and restore your plants to a healthy state. Of all the things that contribute to a plant’s health, the soil is the most important. The good news is unlike temperature or precipitation, you can cultivate healthy soil by adding organic matter or fertilizer and trying to avoid disrupting the soil as much as possible (no rototilling!). You have to invest time and effort to keep your garden healthy and free of disease and pests. It’s as simple as keeping things neat and tidy – removing fallen leaves, pulling weeds, completely removing dead or diseased plants, etc. A little work in the off-season can help keep plants healthy all year round. First, research what grows best in your area. Start with what you love and then consider what grows best in your zone, and finally, your specific yard, in terms of sun exposure, water usage, etc. Any nursery or garden center professional can help you think through what will thrive in your space. This can be a more complicated question than it seems. If planted too close together, the long-term health of a plant can be compromised. A nursery or garden center professional can help you answer and think through these questions to ensure you have as healthy and viable a garden as possible. As a general rule, fall and spring are the best seasons in which to plant most types of plants. The conditions and type of your soil are also factors. Read up on the conventional wisdom of planting in your region, your soil type, and your climate. The moral of the story is a green thumb is kind of a mythical designation. If you want a healthy garden, take the time to do your research and talk to the professionals. Ultimately, you will save time and money and have a garden that brings you joy – maybe even a bounty of fresh produce! Summer is just getting started here in Maryland…but the sun is already at full force. We are expecting record setting heat this week. Here are some tips and tricks to keep your plants happy in the heat. Many stressed plants look thirsty. Green foliage turns grey and droops; blossoms and leaves fall to the ground in a desperate attempt to save the shrub. A deep watering often brings a plant back, or at least saves it so it’ll bud next year. But if leaves are crispy, or the plant continues to look parched in the evening, then it’s reached a permanent wilting point: this plant will need to be removed and replaced come Fall. Perennials: Cut blossoms and stalks, which gives plants a rest and raises chances of returning next year. Established trees and shrubs, at least two years old, which have deep roots. Container plants: Move them onto a porch or under a shade tree. Here’s a watering rule of thumb: Water deep, not often. Water should reach 8 to 12 inches down, creating a well of water for plants and trees to draw upon in high heat. To determine if you’ve reached your mark, press a large screwdriver into the soil: If it meets resistance, keep watering. Hand-watering with a garden hose and aerator is best. Count to 10 as you water the base of plants. Move and repeat. If you have lots of property to water, then use a sprinkler, but adjust it so it doesn’t waste overspray on driveways and walkways. Water in the early morning: Not 7 a.m. when you usually roll out of bed, but when the sun rises at 5 a.m. or 6 a.m. However, don’t get fixated on watering in the morning. If water restrictions require only evening watering, soak ‘em good and don’t fret about fungus forming on leaves that stay damp throughout the night: A little powdery mildew won’t kill your shrubs, but dehydration will. If you didn’t mulch in spring, do it now. Mulch will keep moisture in the ground and suppress weeds, which compete with landscaping for water. If you haven’t mulched, water thoroughly, then add mulch to a depth of 3 to 4 inches. At Hometown Landscape & Lawn Service we understand that your landscape is an investment. Here are some tips to ensure a happy transition from fall to winter. Mulch is especially important for plants during the fall. Mulch acts like a blanket for your plants’ roots, keeping them warm and protected during the winter. Not only does a layer of mulch protect roots from frost, it also helps to retain moisture during the cold, dry winter. To mulch your plants, simply spread 2 to 3 inches of mulch around the base of your trees and shrubs. It’s best to invest in a quality hardwood mulch. If you have any annuals that die out when frost hits, it’s a good idea to take the time to remove them before winter really sets in. Removing dead and dying plants now is a great way to prepare your landscaping for winter, because it tidies up your landscaping for spring. Now, when spring rolls around, you’ll have a nice, neat landscape instead of one that is full of dead plants that need to be removed! Do you ever worry about your shrubs when you’re sitting inside your warm home watching the howling winter winds whip through your garden? Strong winds and heavy snow can leave delicate shrubs looking ragged by spring. You can protect your shrubs by wrapping them in burlap. For smaller plants, cover them with overturned pots or buckets to protect them. Give us a call! Hometown Landscape & Lawn Service, Inc can help get your landscape ready for the winter! Call us at 301-490-5577 today! Should I have my gutters cleaned before Winter? If you have noticed your gutters are clogged with debris, now may be the best time to have them cleaned! Your gutters serve the purpose of directing water away from your home so that leaks and rot damage do not happen to your roof and foundation. When the gutters become clogged water can pour over the sides or debris can freeze causing cracks to form. To protect your investment and maintain the integrity of your gutters, a yearly cleaning before the temperatures drop is essential. If you choose to clean your gutters on your own remember to have someone spot you while on a ladder and never clean them alone! If you cannot safely clean your gutters on your own, please call Hometown Landscape & Lawn, Inc to schedule a complimentary consultation and quote!